This Blackhawk 4145 SERPA Light Bearing Holster is designed to accommodate handguns equipped with the Xiphos NT weapon light. Its compact shape makes it ideal for concealed wear, and it comes with both a belt loop and a paddle platform for versatile carry. It can also be mounted on a S.T.R.I.K.E., Quick Disconnect or Tactical Holster platform. It features SERPA automatic locking technology that secures the weapon immediately upon reholstering. The release lever is easy to trigger during the draw, making it quicker to release than a thumb break or strap for rapid target engagement. The low cut sides provide easy access to your weapon. The holster also features an adjustable retention device, allowing you to set a custom level of passive retention. Will this allow for a slimline rail attached laser from laserlyte? Serpa holster is made to fit Blackhawk Xiphos weapon light only. Yes and you can adjust the retention. 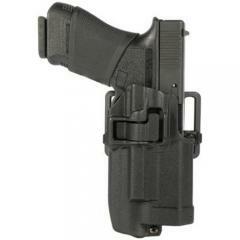 Will Xiphos NTX (Blackhawk #75206BK) fit this holster? Yes, the holster is designed to fit the Xiphos NTX light only. Does this holster include the paddle or just the belt loop? My Glock 22 has a surefire X300 on it so will this Holster work for me? No, this holster will only fit weapons with Blackhawk's Xiphos light.